With its spinning gears and bright, chunky connecting pieces, the CLIPO CREATIVITY TABLE system is a platform for imagination and fun! 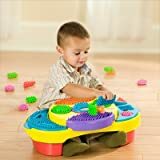 At this all-in-one play station, toddlers can develop their fine motor skills while enjoying a shape sorter and a drop slot, too. Spinning turntables let kids display their masterpieces on the table or remove for stand-alone fun. Includes table base, 2 storage buckets, 2 peg plates, 2 lids, motorized gear unit and 25 CLIPO pieces. I guess my kid is a genius! She has been playing with these since she was 12 months old with no problem. She loves this toy. Very durable as I find her using the table as a step stool, not recommended of course. Great creative fun toy! I was excited about the Clipo table when I saw it on TV, but we were pretty disappointed when we bought it. The blocks don’t really stick together well, so anything you make falls apart almost instantly. The table didn’t do much to make them more fun either. How can you spin a creation that just fell to pieces? My advice is to buy the classic bristle blocks or Krinkles instead of these. They are the same sort of idea, but they work way better.